When it comes to gut flora, the ideal is a golden mean: you want those friendly bacteria to be thriving and happy, but not so happy that they cross the line into overpopulation. And you also want them primarily in the large intestine; if they decide to get adventurous and start exploring other places, you’re in for trouble. Unfortunately, a surprisingly large number of people have one or both of those problems: too many microbes, in the wrong place. And just switching to Paleo isn’t always enough to solve the problem. SIBO, or Small Intestinal Bacterial Overgrowth, is just the technical term for gut flora growing too abundantly and in the wrong place. It’s not entirely the same thing as Irritable Bowel Syndrome, but it’s close, and the two are closely related (there’s an especially close connection between SIBO and IBS-D). Recent studies have shown rates that up to 40% of people (and up to 78% of Irritable Bowel Syndrome patients) have some form of SIBO. Dangerous weight loss; inability to gain weight no matter how much you eat. Malnutrition and nutrient deficiencies even if you’re eating plenty of nutrient-dense foods. SIBO is also closely associated with all kinds of other conditions that don’t seem to have any obvious connection to the gut – for example, it’s been linked to both fibromyalgia and rosacea. Considering that it’s so common, just having the symptoms makes it a pretty safe bet that you might be struggling with some degree of SIBO. But if you’re looking for an official diagnosis, unfortunately, the options are pretty limited. Glucose: a glucose test will diagnose SIBO at the close end of the small intestine. Lactulose: a lactulose test will diagnose SIBO at the far end of the small intestine. Breath tests are great because they’re noninvasive and easy to take, but they also aren’t very precise. For one thing, there’s no clear consensus about the line between “normal” results and an “overgrowth.” False negatives and false positives are both possibilities. More precise tests are available, but they’re also more of a pain. For example, you can get a biopsy, but this is a pretty major surgical procedure where a doctor actually physically collects tissue from the inside of your intestine. For most people, the expense and inconvenience just isn’t worth it. Ultimately, many people just end up taking a breath test, and then taking the results with a grain of salt. If you have symptoms of SIBO, it’s worth a stab at some treatment options (see below) no matter what the breath test says, especially since most treatments are very low-risk and you haven’t lost anything if it fails. Certain gastrointestinal infections, especially gastroenteritis. Other pre-existing gastrointestinal disease (e.g. celiac disease and Crohn’s disease). 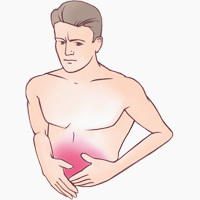 Physical problems with the intestine (for example, dysfunction of the valve that joins the small and large intestines). Anything else that can cause constipation. The causes are incredibly varied and hard to pin down, but hopefully as more people keep studying the issue, we’ll get some better ideas of what causes SIBO and how to avoid it entirely. Treatment approaches for SIBO depend on whether or not you’re working with a doctor. If you have a good gastroenterologist, prescription antibiotics (especially Rifaximin) can help a lot. It’s true that antibiotic overuse causes a lot of gut flora problems, but used appropriately (and coupled with a treatment plan for restoring the healthy flora), antibiotics are a perfectly legitimate tool for healing as well. Enteric-coated peppermint oil has shown a lot of promise in other studies; it seems to work something like a natural antibiotic. And you can also get it over-the-counter, with no prescription necessary. Just make sure to get a high-quality brand: if you’re trusting your health to a supplement, you definitely don’t want to cut corners. From a dietary perspective, Paleo is a great place to start, but you’ll probably need to modify it a little. 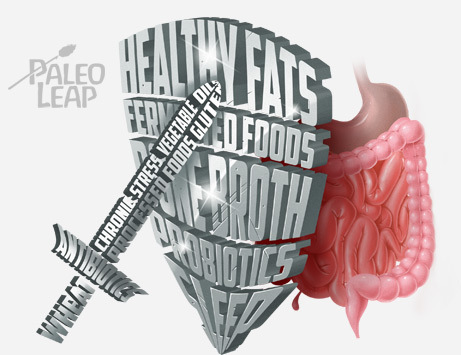 Many people have great success with a Paleo diet optimized to starve the bacteria in the small intestine. Bacteria feed on carbohydrates, and if you don’t give them any food, they’ll die off. To accomplish this, you don’t have to stop eating carbs entirely. Healing protocols vary, but typically there’s a period of very low-carb eating followed by a reintroduction phase where you focus on carbs that are mostly absorbed by the time they reach the bacteria (so they don’t provide any more food to fuel the overgrowth). For mild cases, many people find relief just from eliminating FODMAPs. Often, it also helps to focus more on cooked foods – fiber feeds bacteria, so reducing fiber by cooking, peeling, and otherwise preparing your vegetables can help you get enough nutrients without feeding the overgrowth. For stubborn cases, though, a more dramatic change might be necessary. If you want a more detailed overview, food lists, or specific information about what to eat, this page is a good place to start, with very helpful overviews of some of the most common treatment protocols. Whatever you try, be aware that if it does work, your symptoms might get worse at first. This is called die-off or a Herxheimer reaction; it feels almost like having the flu, and lasts anywhere from a few days to a week. It’s awful to deal with, but it does go away! So don’t be discouraged if symptoms don’t immediately start improving; it’s worth waiting a week or so to see whether you’re actually just suffering from die-off. Treating gut problems is frustrating, not least because it’s hard to see what’s actually going on down there – even the best tests we have aren’t anything close to perfect. On the other hand, though, the increasing attention that scientists have been paying to the gut flora lately is encouraging: hopefully someday soon we’ll have a really effective treatment, or better yet, a way to prevent the whole mess in the first place. Until then, there are a lot of very promising diet therapies and supplements out there to try – keep on tweaking until you find something that works for you.